I described how to modify the router to remotely control the speed and light there. Let me know if that’s what you need. thanks a lot tony, this is exactly what I needed. I just gonna wait 6 month until my router’s warranty is over, we never know! Made a quick video showing the sound difference with the enclosure. Hope it is helpful! Thanks for sharing the video. I’d guess the double walls knock an extra 5dB or so off. It’s hard to say for sure because bit size, router speed, material and feeds, shop floors and walls all influence sound levels. It’s great seeing more enclosures in action. I’d never want to use a router without one now that ive gotten used to the benefits. Hi Tony I am Loving your work I would be very keen to know how you moved the stepper control box to the outside of the housing. It looks like you have plenty of slack on the nema control wires, on my vanilla installation, I had just enough to connect with an inch or so spare so would love to know how you achieved this. I just soldered in extensions. It was easy but tedious. The electronics hang off the left edge a bit, and you’ll want room for cables to run. That is correct. I originally designed it to use less plywood but adding a couple inches to the width is worth the extra cost. Figure out how you want to handle dust collection and base the height on that. If I were to make another one I would probably try to bring the DC hose from the top. However the way I have it now works great 99% of the time. I don’t know if I would make it any bigger front to back. The way it is I can reach the back of the cabinet easily but I have to leave the door open if I need the full 33" front to rear. I rarely need to use that extra travel up front so being able to reach the rear is worth the trade. I don’t remember the dimensions I listed but 2" extra width, depth to your preference and height at least 3" taller than I used, maybe more depending on what you are going to do with DC. Figure that out first before you build your enclosure. I have a question about the base. I’m putting my XXL in my basement for now, with the idea that we might be moving in the next year or 2 so I am going to build the enclosure detachable from the top. So my question is how important in the torsion box base? I was planning on building the legs out of 2x4’s or 4x4’s but making them able to come part to fit through the basement door. So if I got beefy base, Torsion box top and then enclosure is that decent enough to maintain stability in the machine? Or should I build everything out of 3/4 plywood? legs base and enclosure? A sheet of 3/4 good 1 side spruce plywood here is $60 as soon as I break the 48" mark for measurements on things it just gets crazy. Also I think everyone is a fan of mounting the cnc directly to the base. What about adding leveling feet to the base of the stand? A torsion box base is a nice starting point — precision has to start somewhere, and a rigid level surface allows one to reference off it. That said, lots of folks just grab a table or workbench and install on that, and lots of other folks have dispensed w/ the leveling feet (I did, and I need to do something about the PEM nuts as well). 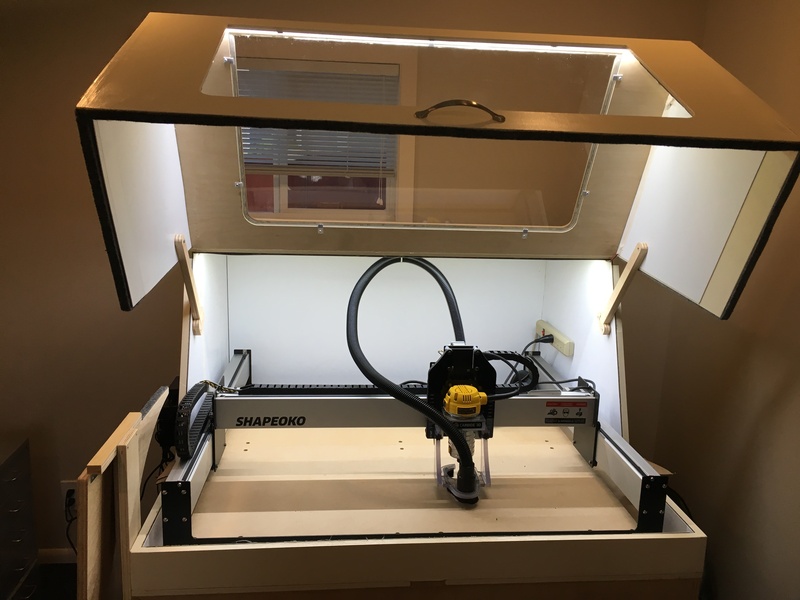 The whole point of the torsion box is to attempt to lessen or eliminate wracking of the cart top, thus keeping the CNC’s frame and spoil board from twisting. I took a different route, and, so far, it looks promising. 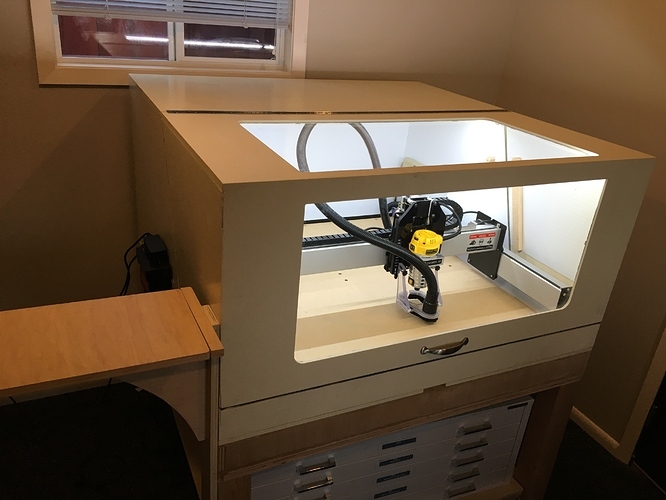 I built a big plywood box cabinet with a 3" thick laminated MDF top, put 3" casters on all 4 corners, and was happy. Til I rolled it out of it’s normal spot and observed it lifting one wheel off the ground. Skipping the casters and going to adjustable feet was not an option. For a couple of reasons, the torsion box route didn’t appeal to me, and it looked like a brute force approach. After toying with dropping down to 3 wheels, as in, a 3 legged stool never wobbles, I instead created a 42" laminated plywood beam, with casters on the ends, that pivots at the center rear on a piece of 1 1/2" galvanized pipe. Some foam pads made of floor mats, on the bottom of the cart, act to dampen movement of the beam. The pivot point acts as a phantom 3rd wheel. No more wobbling, thus no more wracking. I can roll any wheel up on a 3/4" bit of scrap and its still stable. Yes, if I apply my full weight to a rear corner, I can lift the other side up, but my Shapeoko XL unit will be centered, and weighs far less than my XXL self. Its all still a work in progress but I think I dodged the whole torsion box issue. If casters aren’t in your plan, you could replace them with feet, and again, there should be no need for a torsion box. I cut out some smaller pieces of acrylic, glued them to where I wanted the mounting points for the ends of the gas shocks, and then drilled the mounting holes for the screws on the exterior of the acrylic door. The 50#, or 45#, gas shocks seem to work, except the door would close eventually. I had to integrate kickstands, a bit of a rough hack, but they work to keep the door open as needed. 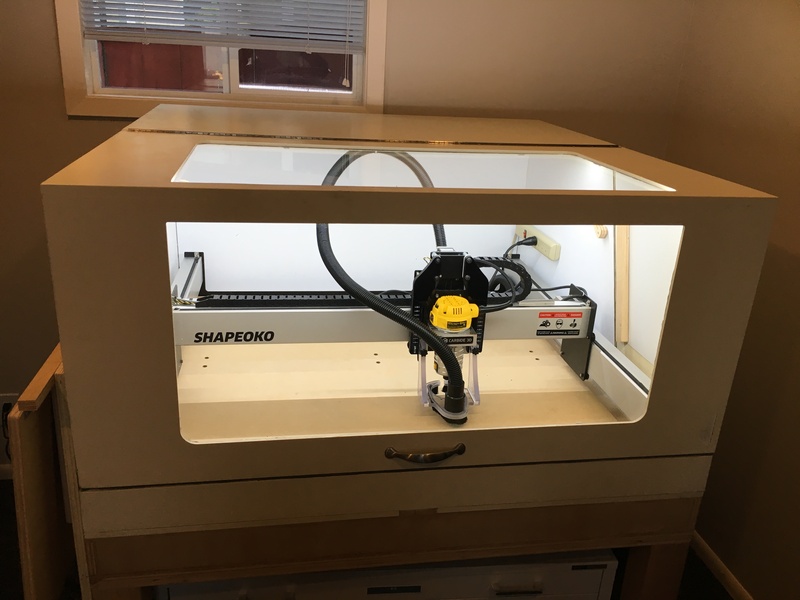 I am building an enclosure very similar to your plans and was wondering what you used to cut your door out? I was thinking of using something like a rotozip but was also wanting some other ideas. I am well on the way to building the enclosure. I did a nice torsion box 3.5" H on a stout 49 x 48" x 24" base. It’s solid as a rock. Setting up the machine now. and making the enclosure in tandem. I checked out your youtube channel as well , subscribed- good luck with it. 1/2" internal eggcrate/half lapped cross members every 8" in both directions. The enclosure is pictured here finished. I am very pleased with the result . The router noise is very minimal. The 63 dB Nilfisk vacuum is a lot louder than any noise emitted from the router when cutting. 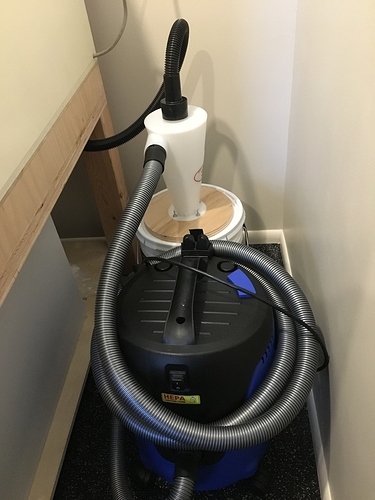 I found a low cost variable speed control for that which lower the vacuum noise considerably. I’ll be adding a short video showing all the detail and will annotate with sources and specs for the components. I used mass loaded vinyl on the interior of the box 1/16" thk to contain the sound, and 2 LED strips ( 30 K color) on the interior.